This week at Stampotique is anything using Washi Tape. I have a few rolls of this from Tim Holtz but it comes in all different colours and patterns. I coloured the ‘hold up tapes’ with green Promarker. 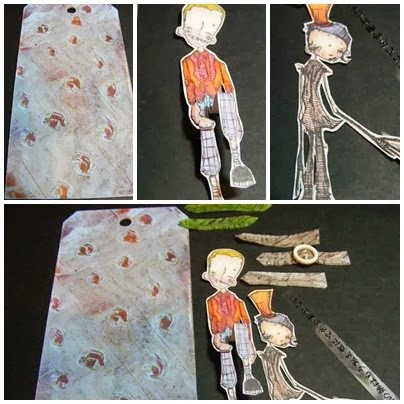 Below I have copied a post I did a while ago on ‘How to make your own Washi Tape’– Have a go! I firstly used a Tim Holtz tag and did my usual geli plate background with acrylic paint and made the circles with an embossing pen. I was looking on the Internet at washi tape when I came across a picture on pintrest which is the basis of my theme this week. I have used Toby and Kolossal as brother and sister, colouring them in with Promarkers. I cut Toby’s hands from his body and added a further pair of pants. I then bent his legs to give some dimension being stuck to the tag. I gave Kolossal a roll of tape in her hand and coloured the lines of tape with Promarkers and added a buckle for embellishment. I then printed this off onto acetate and put the English version on the top of the tag and the Japanese version down the side. ← A Piece of Cake…. Fabulous tag. Thanks for joining us at Stampotique this week. Love that bent up knee for dimension, and great fun to have him carrying the washi tape. 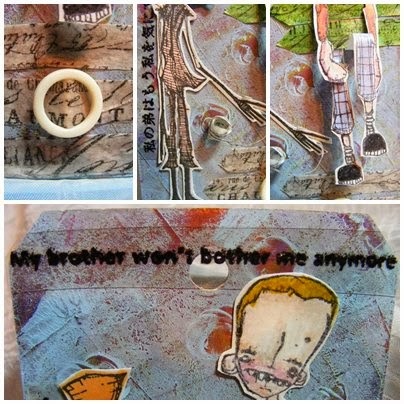 Love how you have given Brother a look of dimensional struggling–quite clever! Love your tag! !